This RV trip took us from Richmond into far-west Texas again, for the Teague-Miller Reunion. On the way out, we stopped in Abilene for a few days of site-seeing. On our return to Richmond, we stopped in San Angelo for some more site-seeing. Our trip lasted almost 2 weeks. The weather was good - no rain - but it got hot and humid as we got back closer to home. We did enjoy the west-Texas low humidity for a while, however. We left Richmond at noon on July 3rd and traveled up TX-36 to Temple, TX. At Temple, we spent the night on Lake Belton at Cedar Ridge Park. This is a nice scenic park bordering the lake, complete with boat launch. We called Kay's cousin James and he and wife Willa Dean came out to visit us and we all went out and ate Mexican food. < Our campsite at Cedar Ridge Park near Temple. 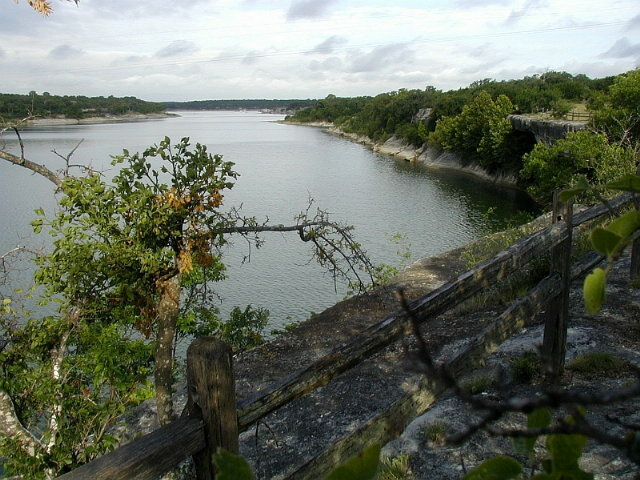 < A view of Lake Belton from the campground. Next morning, we left Temple and continued up TX-36 to Abilene. 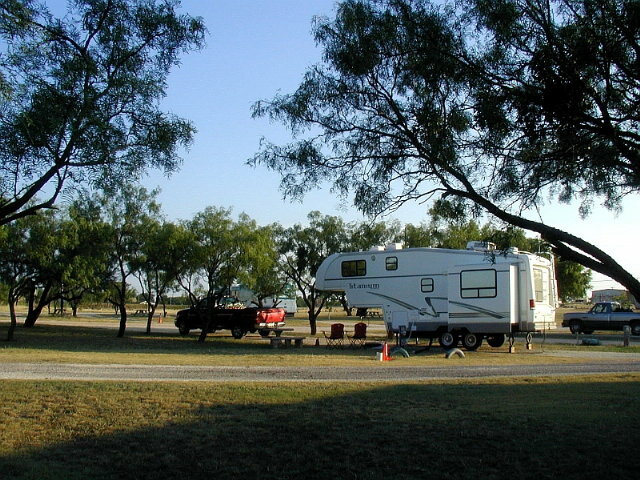 We set up camp at Tye RV Park in Tye, which is a few miles west of Abilene on IH-20. We decided to skip 4th of July fireworks that was being held at a city park across town. 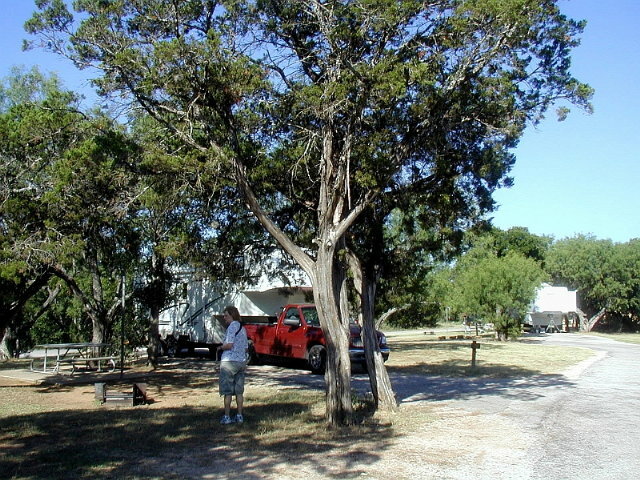 < Our campsite at Tye RV Park. Wednesday morning we drove into Abilene to the visitor center that is located in Frontier Texas. We picked up brochures and decided to take the walking tour of the historic downtown. 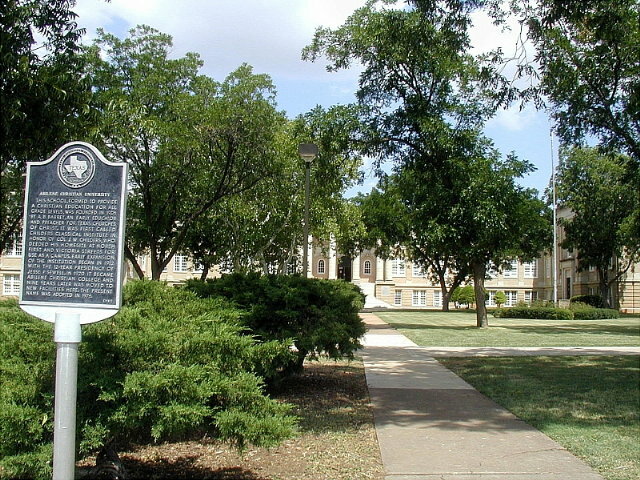 The tour covers 24 points of interest over a 25-block section of downtown Abilene. Of interest was The Windsor, which was built in 1927 and was leased by Conrad Hilton and was the first hotel to bear his name. 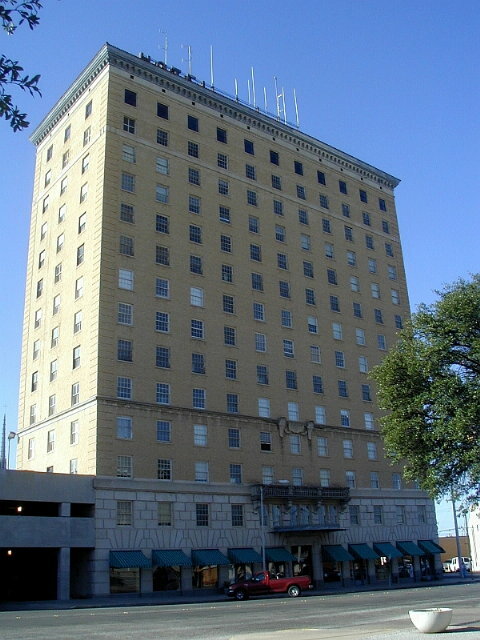 It was renamed the Windsor Hotel when Hilton's lease ended in 1945. 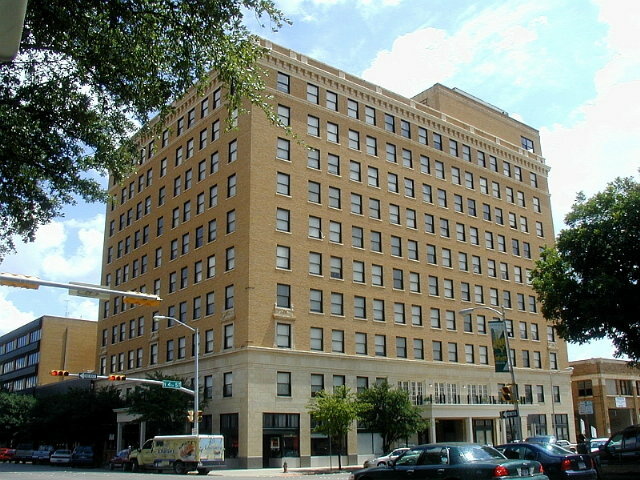 The 16-story Wooten Hotel was built in 1930. Its height and Art Deco design made the building a local landmark for many years. We completed the walking tour by noon, and returned to the trailer for lunch. < The Grace Museum. 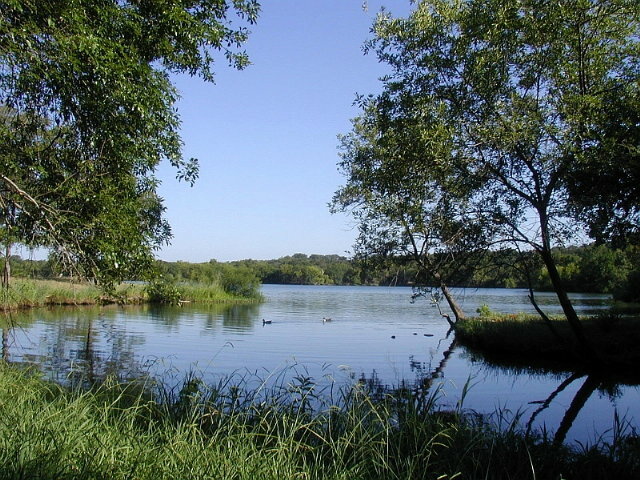 < Vera Minter Memorial Park. < Wooten Hotel. < Hilton Hotel (The Windsor). After lunch, we drove about 10 miles down TX-89 to Abilene State Park. The temperature was a little warm, but we decided to take a walk down the Cedar Creek Trail to see if we could see any new birds. The trail leads though thick woods, but we weren't able to see too many birds, but heard some that we couldn't identify. Afterwards, we returned to the trailer via Albertson's grocery store. 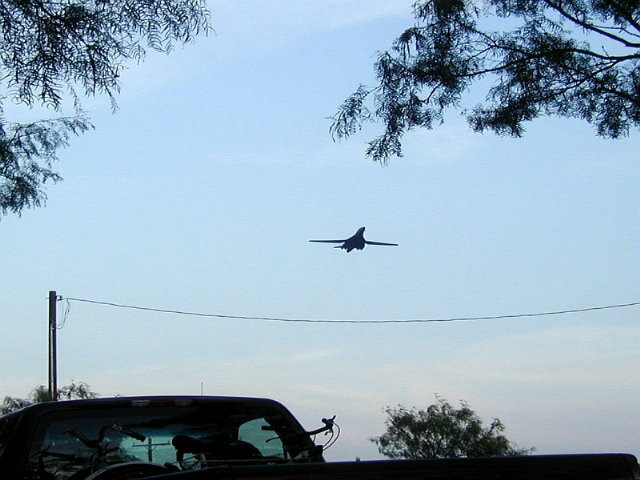 After we had eaten supper, we discovered that the RV park was located about one mile from the end of the Dyess Air Force Base runway used by B1B bombers taking off about 3000 feet above our trailer with their 4 engine afterburners going full blast. They rattled everything like an earthquake and the noise level was deafening. These random takeoffs lasted until about 11:30 PM. 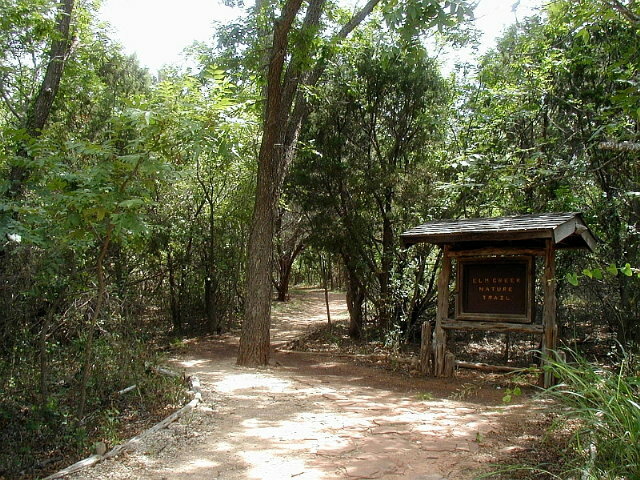 < Cedar Creek Trail at Abilene State Park. 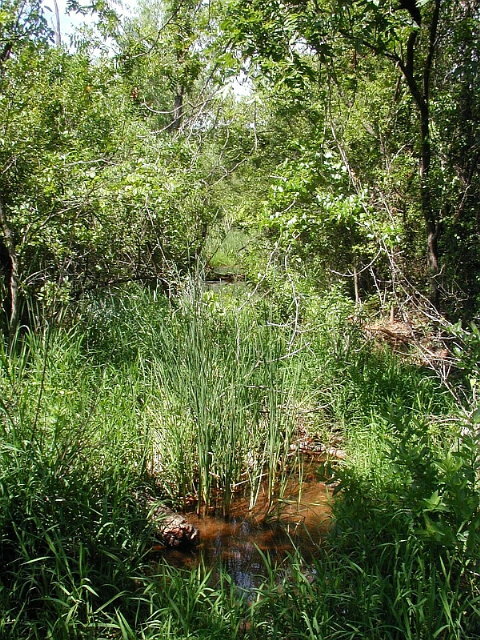 < Cedar Creek peeking though the vegetation. < A B1B bomber blasting off over our trailer!! Thursday morning, we drove to Abilene and toured The Grace Museum, a restored hotel. It was built in 1909. 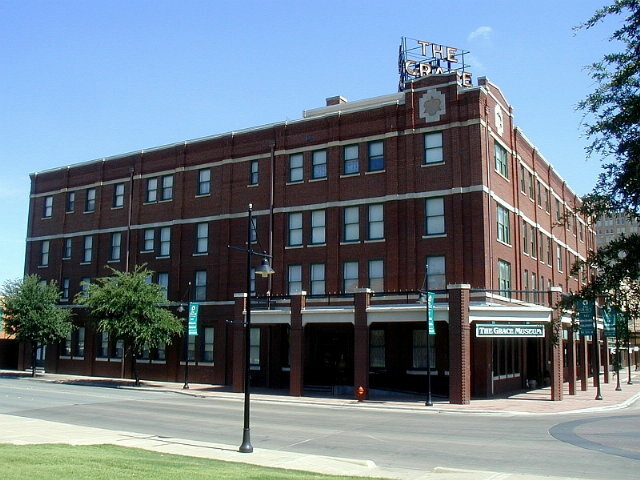 For many years it was Abilene's premier hotel and the first sight seen by railroad passengers as they approached the city. The lobby and ballrooms were excellently restored. Afterwards we went next door to the Cypress Street Station restaurant and ate lunch. 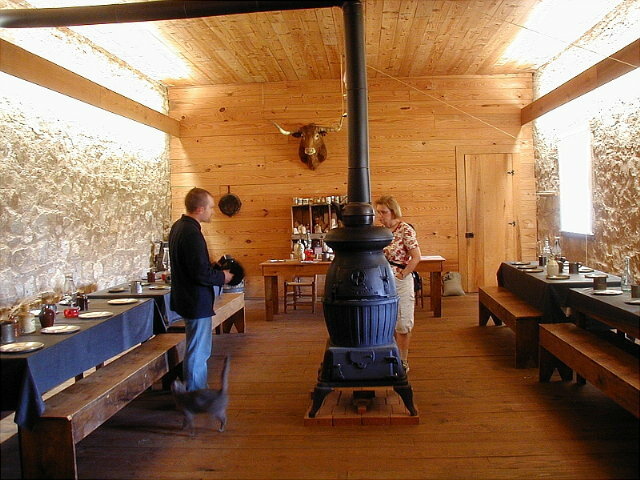 The building was a restored store. 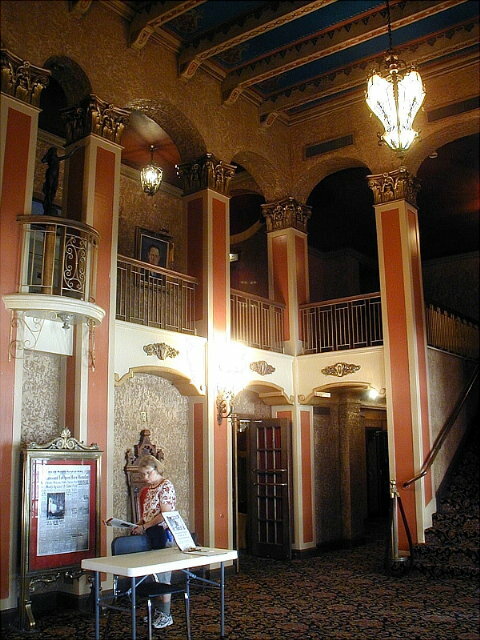 In the afternoon, we toured the Paramount Theater. 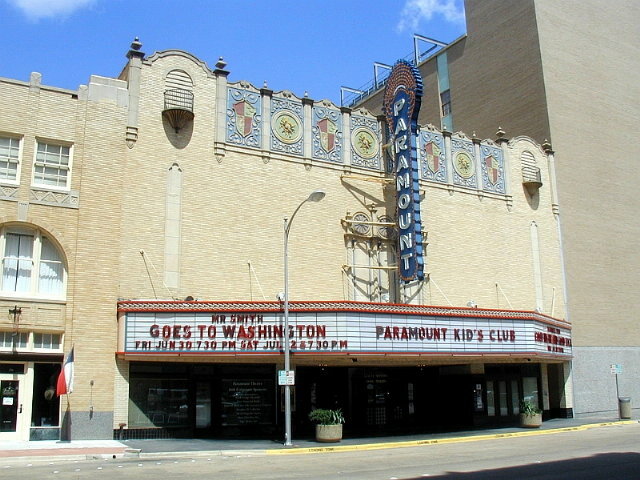 The Paramount opened in 1930 as part of the Wooten Hotel development. 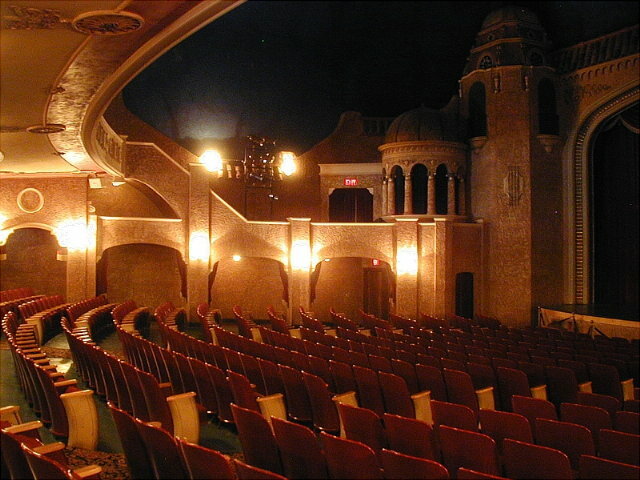 The 3-story theater features Spanish Colonial Revival architecture, Art Deco light fixtures and is best known for the stars and clouds that move across the ceiling during the movie. The beauty of the theater was outstanding, and we were allowed to roam all over, even backstage and into the projection room. < The Paramount Theater. < The Paramount Lobby. 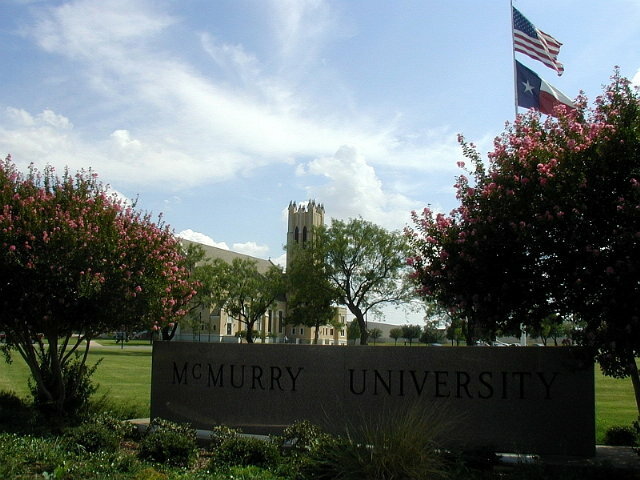 After that we took driving tours of Hardin-Simmons University, Abilene Christian University and McMurray University. Afterwards, we drove to Dyess Air Force Base. As we expected, we were not allowed to enter unless we had a sponsor. We looked through the fence at some of the airplane displays and then drove along Military Road along the periphery of the air base and returned to the trailer. After we ate supper, we sat outside and waited for the B1B's to take off again. We were not disappointed! This time our ear plugs made them more bearable. They approach with almost no warning except a low rumble. 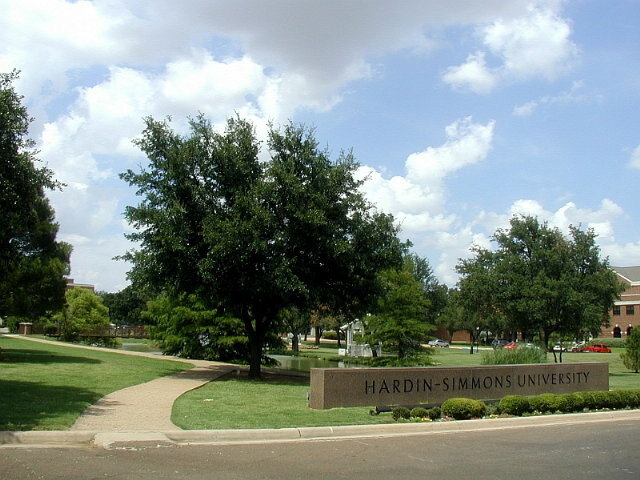 < Hardin-Simmons University. < Abilene Christian University. Friday morning we left Abilene via US-84, bound for Shallowater - just northwest of Lubbock. We arrived late in the afternoon and found our spot at Richard's RV Park. After getting the trailer set in place, we drove to WalMart to pick up a few things that Kay needed to fix a dessert for the Teague-Miller Reunion next day. After breakfast Saturday morning, we drove the few miles over to the Senior Citizens Center where the reunion was being held. We spent the day there, enjoying talking with our families. The catered meal was good and the homemade desserts were delicious. After lunch we had the business meeting, and the auction. The auction is an exciting time for all. Everyone brings items to auction off, with the proceeds going to the reunion to finance next year's event. The bidding is usually very spirited. After more social time, we had supper and about 8PM called it a day and headed back to our trailer. < The Teague-Miller Family Reunion (not everyone was there for the photo). Sunday after breakfast, we went over to Kay's cousin, Norman & wife Betty's house for a cup of coffee, then on to the reunion. The reunion Bible Study was taught by Molly and the sermon was given by Don. After lunch, we said goodbye to all, packed up the trailer and headed south on TX-179 and TX-137 to Stanton. This is the town where Kay's father grew up and where he and her mother met. We camped for the night at the Convent RV Park. This is quite a rustic and natural RV park, located right next to the old Carmelite Monastery. The Monastery was built in 1884 and expanded in 1886. After a severe drought in the area, they sold the building in 1897 to the Sisters of Mercy. Soon after a 1938 tornado swept through the complex, they left and sold the building. Kay's cousins, Jonnama & Morgan - who live in Stanton - came by and we enjoyed visiting with them. 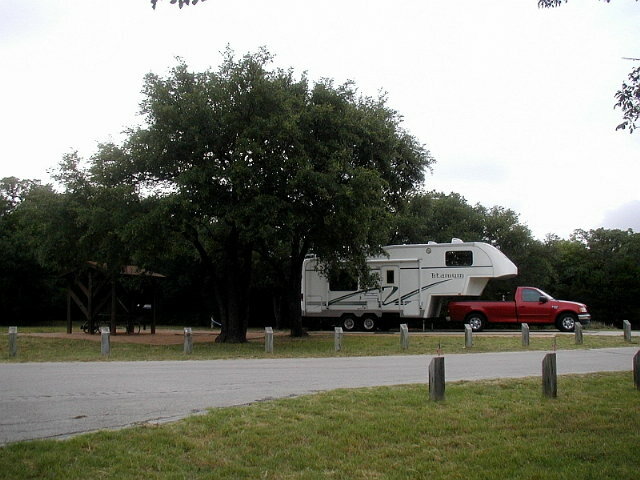 < Convent RV Park in Stanton,TX. < Carmelite Monastery. Monday, before we left Stanton, we stopped by Evergreen Cemetery where Kay's father is buried. We also stopped by the Stanton First National Bank. 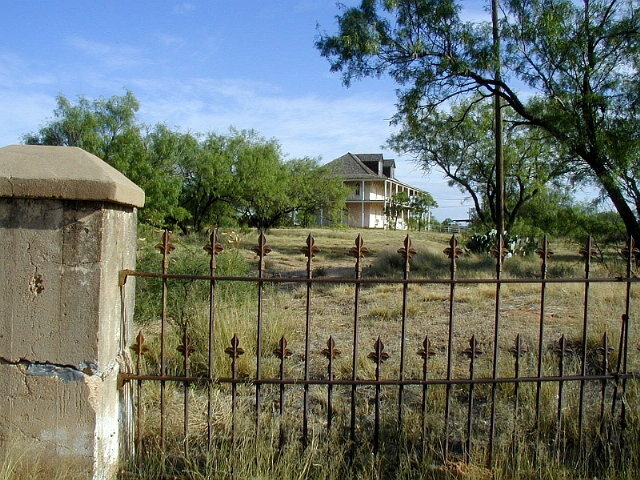 It was founded by Kay's great-great-grandfather, Archibald Lambert Houston, on February 3rd, 1906 with $25,000. It is still in business today, 100 years later. 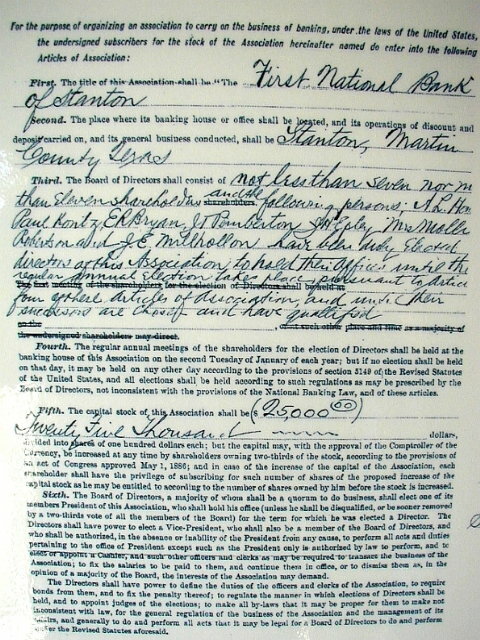 < Stanton First National Bank founding document. We drove south on TX-137 to TX-158 to Garden City. We stopped to eat lunch and went to the Glasscock County Courthouse to check on some land her mother owns. Afterwards, we drove on to San Angelo via TX-158 and US-87. We checked into the Concho Valley KOA. 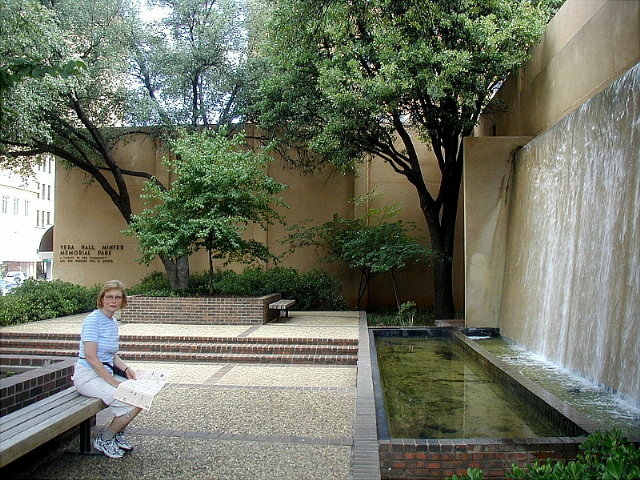 Tuesday we went to the San Angelo Visitor's Center located on the Concho River. This is a very beautiful new center next to a 4-mile walking track along the river. Afterwards, we stopped by the grocery store. That afternoon we met with Kay's friend, Carla, that lives near San Angelo and toured some of the old stores on Orient Street and the Cactus Hotel. We stumbled onto a building maintenance person who was delighted to show us around and gave us an excellent tour. The hotel was built in 1929 and was the 4th hotel built by Conrad Hilton. 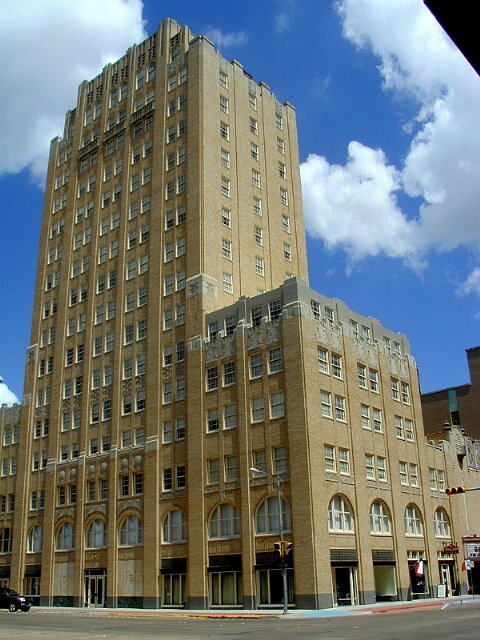 At 14 stories tall, it stands taller than any other building in San Angelo. 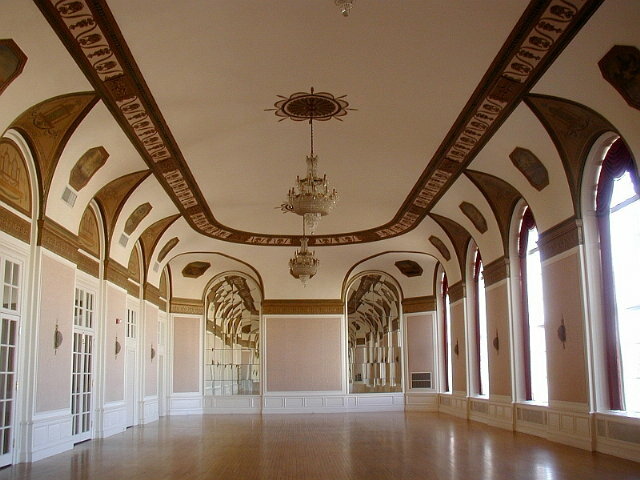 The Ballroom has three large chandeliers, murals framing the ceiling, a wooden floor and six floor to ceiling windows. After supper, we walked the 2-mile Hillside Drive loop that runs by the KOA, which gave a scenic overlook of Lake Nasworthy and good exercise going up the hills. < The Cactus Hotel. < The Cactus Hotel Ballroom. After breakfast Wednesday, we took a scenic drive around Lake Nasworthy on our way to Fort Concho. At Fort Concho, we took the guided tour of the fort. The guide was excellent - dressed in a period wool uniform even with the temperature in the 90s. We enjoyed the informative 1-1/2 hour tour through most of the buildings. 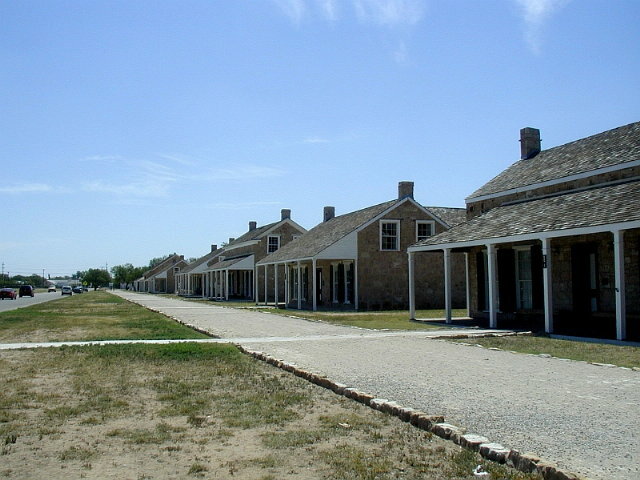 < Fort Concho. < Inside the enlisted men's dining room. Afterwards, we drove to Carla's mother's retirement home and took them out to lunch. After lunch, back at the retirement home, we visited for most of the afternoon. 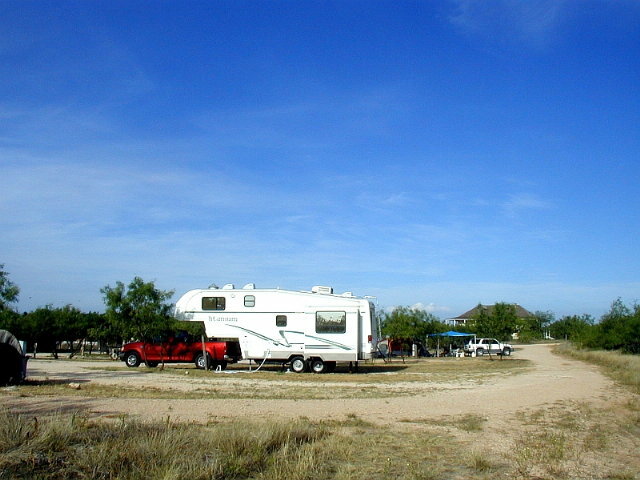 After leaving we made the short drive to San Angelo State Park and drove around the campgrounds. The lake was almost dry and the temperature was 100+ degrees, so even the jackrabbits were resting in the shade of whatever cast a shadow. Thursday morning, after a detour to Discount Tire to repair the trailer's almost flat tire, we traveled down US-87 to TX-71, then TX-29 to Inks Lake State Park near Marble Falls. After checking our email at the library in Brady, we learned of a friends passing away and decided to cut our trip short by one day in order to attend the memorial service Saturday. The temperature was 100+ at Inks Lake and too hot to do anything outside until about 8:30 when we took a walk down to the Devil's Waterhole - it was still 90. 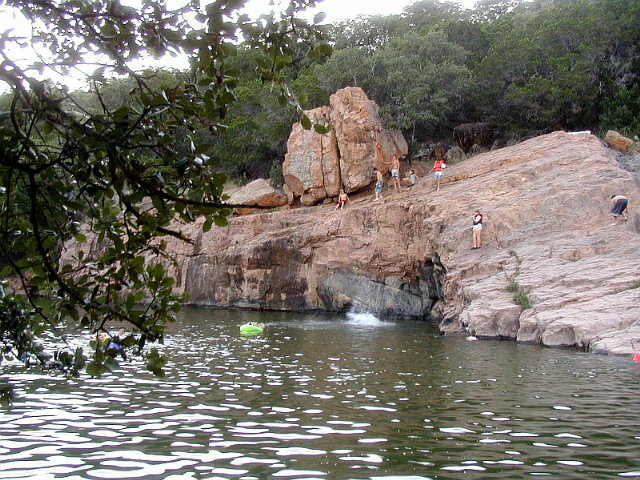 < The Devil's Waterhole at Inks Lake State Park. < The Lake. < Our campsite. The morning of Friday, July 14th, we left Inks Lake State Park via US-281 to TX-71 and IH-10 back to Richmond. This draws to a close our Teague-Miller Family Reunion and West Texas RV Vacation. We hope you enjoyed the pictures and brief descriptions of our activities. God willing, join us again soon for another RV adventure.